Sometimes I drive my husband crazy, like when I get it into my head to create a handmade gift the day before it's meant to be given. My niece's very special 10th birthday arrived right at the beginning of December, and I was just tying off the last knots on my Advent offerings. 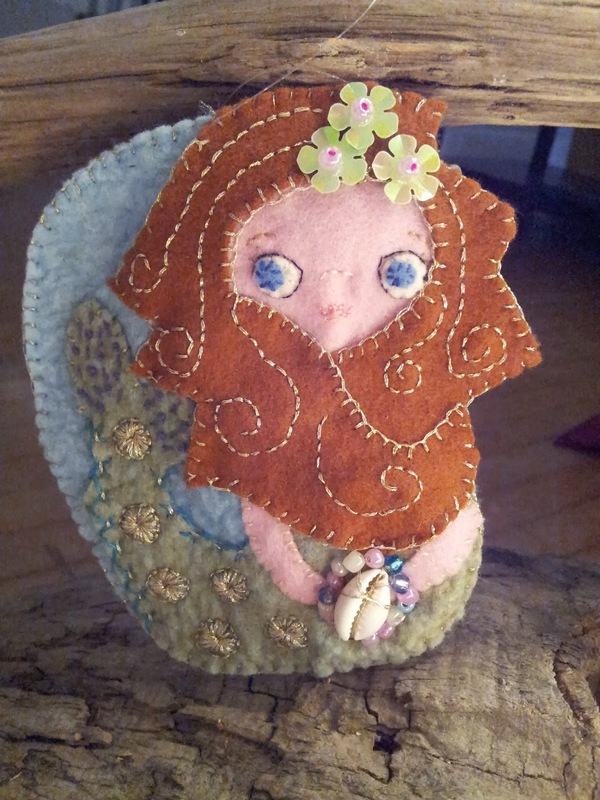 My older nieces had arrived for the weekend, and I'd been dreaming of creating this mermaid ornament inspired by ones I'd seen on Etsy. So on Saturday morning I started sewing. She's just pretty magical, isn't she? I'm not crazy about sewing with the metallic thread but I'm kind of crazy about those circular things on her tail (I don't know what that stitch is called). She's got big blue eyes and curly brown hair like Meredith Ocea, the girl who inspired her creation. You can read about my sister's extraordinary journey as a mother of a child with special needs here. You can read about their special connection with mermaids here. A beautiful gift for a beautiful girl. You are truly so talented. So beautiful - the gift and the girl. And the gift maker. I'm liking those circular details on the mermaids tail too. Is that the metallic thread? It doesn't really show in the photo. This is gorgeous! You are so talented. Hope you have a peaceful and lovely new year.